At different points in my life, I’ve often contemplated if I was born in the right year. That’s because my tastes in pop culture have never really been in-tune with the rest of my generation. Sure the Beatles Anthology made the Fab Four a phenomena (again) with some of my classmates in 1994 (when I was 13), but I was the only one I knew in junior high who took a love for the Beatles and vociferously, bordering on obsessively applied it to other classic rock/pop acts like the Stones, Zeppelin, Paul Simon, Cream, CCR, etc. Later, in college, while friends of mine were huddling together to watch VHS compilations of Family Guy and South Park, I was trying to get people together to watch a copy of The Graduate or A Clockwork Orange. That’s not to say I couldn’t find ANYONE in my age-range who shared in my tastes, but it did take a bit of searching. I think anyone who gets into collecting comics has to have some innate appreciation for vintage pop culture – what else gives a person an impulse to spend hundreds/thousands of dollars of little magazines marketed to children from the 1960s? But even if that’s the case, does that fully explain the affinity I often have for characters and storylines in the Spider-Man universe that pre-date my existence by more than 10 years? Case in point, Amazing Spider-Man #90. 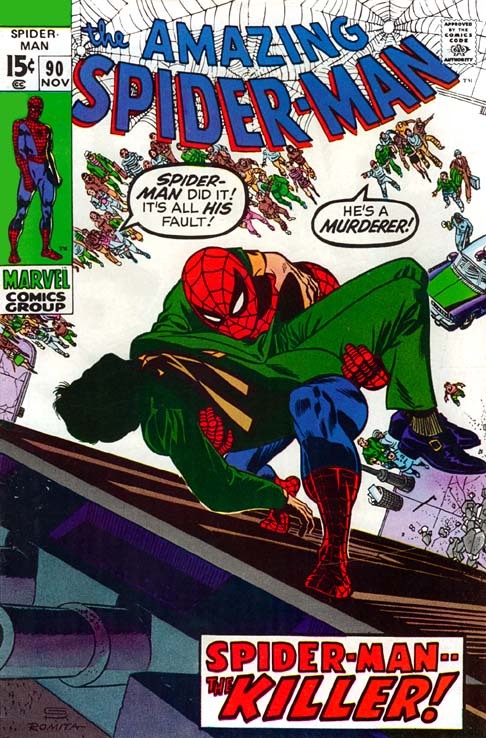 Spider-Man fans and collectors will note this issue as the death of Captain Stacy, the father of Peter Parker’s girlfriend, Gwen Stacy, and arguably the most emotional death in a Spider-Man comic since the death of Uncle Ben in Amazing Fantasy #15 (and obviously a precursor to other, darker moments in ASM history a few years down the road). Obviously, the significance of this issue is not up for debate, but how many Spider-Man readers born after 1980 who have seen, read, or heard of this issue actually CARE about the contents of this comic book? This is not a battle of who’s the best fan. Rather just a statement about the varied tastes of different generations. For example, I’ve talked to some casual fans who don’t understand why in the new Spider-Man movie coming out this summer, Mary Jane is a blonde and her father is a police officer being played by the guy from Rescue Me. It’s conversations like that which make me wonder if there is an entire generation or two of Spider-Man fans reading the current product who don’t even know about the Stacy’s. Staying true to my roots, I’ve always been drawn to the story of Peter and Gwen and Peter and Captain Stacy. Having a legitimate father figure who was both supportive and always a bit skeptical of Peter and his relationship with the unknown Spider-Man was a great dynamic in the comic, and something that I find to be sorely lacking today where Peter is mostly interacting with his contemporaries. Peter Parker/Spider-Man is always at his best when he’s surrounded by intuitive and intelligent people. When I go back and re-read those classic issues from the 1960s, I always look forward to reading the Peter/Captain Stacy sequences. To me, there’s always been a certain aura surrounding the Stacy’s. Perhaps it’s because I was born years after they both died, but in many ways, going back and reading those Silver Age issues of ASM is like discovering a person you’ve known for years and a whole other life before you were ever in the picture. Before there was Mary Jane, Peter loved another girl. 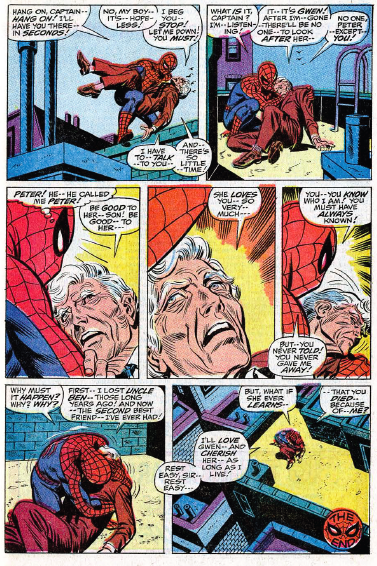 Despite never having a true paternal figure to look up after Uncle Ben died, there was another character who’s dying wish was for Peter – in his Spider-Man attire mind you – to look after his daughter. 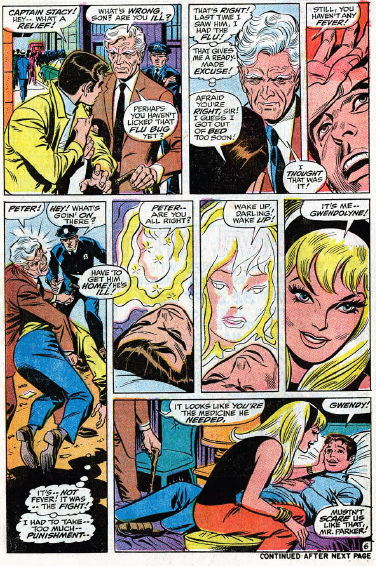 A scene like Captain Stacy’s death in ASM #90 would probably come across as a bit of cliché if released in a comic book today, but when you look back at it in the context of the late 60s/early 70s, it’s heartbreaking to read a sequence like that in a comic book. You just didn’t get that kind of storytelling on a consistent basis. That’s why ASM #90 is a special part of my collection. Oh sure, they’re ALL special, how can you ask a parent to pick out his favorite child? But I’m sure collectors know what I’m talking about. There wasn’t anything terribly unique or fascinating about how I acquired this comic book, but that doesn’t diminish its personal significance all the same. The death of Captain Stacy is one of ASM’s most fascinating moments in my opinion, and while today’s generation of fans are likely more drawn to a comic featuring Carnage or Toxin or Spider-Man on the Avengers, 30-40 years from now, when I’m looking back over my comic books and thinking about which individual issues mean the most to me, I’ll immediately be drawn to #90 and be reminded once again about how I was acting many years older than my actual age.